See the Awards Matrix to determine the number and type of awards allowed by your festival size. Only students involved in a participating production are eligible. Non-competitive entries are not eligible for awards, group or individual. Awards of Merit: The adjudicator may also select other deserving students to receive Awards of Merit for acting or other theatrical achievements. Six Mira Awards (Mira's) selected by the Adjudicator for Individual Exceptional Achievement. Twelve awards for Outstanding Achievement (one is to be awarded for outstanding stage management). Various other Proviincial Awards, Busaries and Scholarships. Bre-Anne Newby - A History of the World – Grimsby S.S. 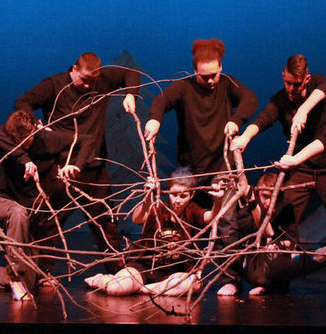 Performance – The Ensemble- A History of the World – Grimsby S.S. Costumes, Make-up and Hair – Jacqueline Karabatsos, Katie Macdonald, Bridget Quin, Marcell Cardozo, Cynthia Pelletier, Renee Somers – Colours in the Storm - Huron Heights S.S.
Ensemble Performance – Julia Hall, Tristan Nichol, Marshall Wood – The Father Clock- Timiskaming District S.S.
Ensemble Performance – The Company – Albertine in Five Times – Westdale S.S.
Musical Composition and Performance – Tori Ly - A History of the World – Grimsby S.S.
Kieran Russell, Listowel District S.S.
Nathanya Barnett, Goderich District S.S. The Cast of BIG LOVE for commitment to the story in a rich and complex play, Crystal Beach H.S. Julia Roglich & Russel Niessen for the beauty & magic of their dance duet, DRAFTS, Westdale S.S.
Devin Scully & Zack Berwick for their score, LAST MAN HANGED, Goderich District C.I. The Production Team for design, SHUDDERSOME: TALES OF POE, Listowel District S.S.
Thomas Hamilton for performance, LAST MAN HANGED, Goderich District C.I. PERFORMANCE - The Company - Family Stories: Belgrade - The Academy for Gifted Children - P.A.C.E. DIRECTING - Lily Azzopardi - Family Stories: Belgrade - The Academy for Gifted Children - P.A.C.E. PERFORMANCE - Michal Fishkin - Family Stories: Belgrade - The Academy for Gifted Children - P.A.C.E. DESIGN - Taylor Violet Ross, Sienna Upton, and Production Crew - The Struggles - Waterford District High School. TRANSLATOR AND CO-DIRECTOR - Shulie Smolyanitsky - An Ordinary Miracle - Brantford Collegiate Institute. PERFORMANCE - Abby Guse - The 9 Worst Breakups of All Time - Eastwood Collegiate Institute.